Tile work and counter tops! ^Mac...before with "old man comb over"! ^Nothin' cuter than a babies piggy's!! Little Miss Aspen...sportin' her spring toes!! The REAL Red Velvet Cake! 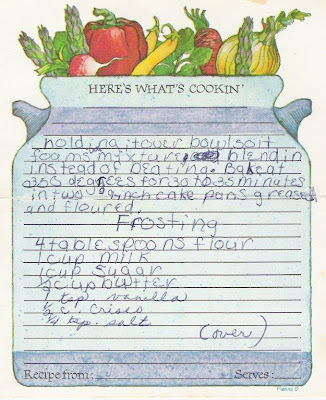 Remember the day when we actually wrote out a recipe card? Now it's just search... find... print! Oh and can you make me a copy of your recipe please? Computers make life SO much easier...or do they? When I was 9 yrs. old and in the 4th grade... I hand wrote out the above recipe card from my teacher Mrs. Rundle. She made a Red Velvet cake and I thought it was absolutely the best thing I had ever eaten! Still to this day it's my favorite cake!!!! BUT...it HAS to have the REAL Red Velvet Cake frosting on it! None of that cream cheese frosting stuff!!! Although...that has a place of it's own but NOT on a Red Velvet Cake!! I'm so glad I still have that recipe card. 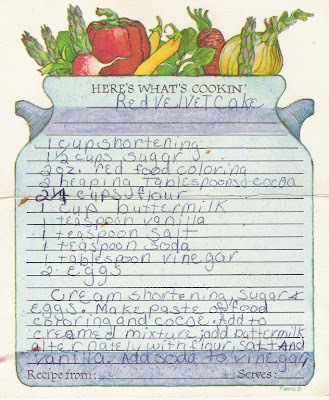 Do you think today's 9 yr. olds will have keepsakes like a handwritten recipe card years down the road? 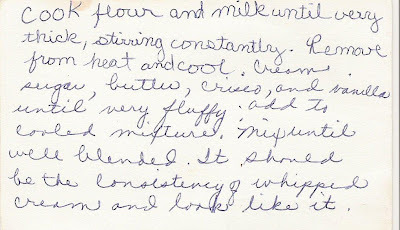 I still love the fact that I have some of my Grandma & Great Grandma's recipes in their handwriting! Such treasures!! I've always dreamed about writing a book. It's kind of been a standing "joke" with my family since I was a teenager! I've always had in the back of my mind that I WANT to do this. There is absolutely NO way that I could do this on my own! I definitely have the "testimony material" but God is going to have to guide me, hold my hand, carry me, d-r-a-g me, AND give me a title!! The big question is, WHAT will it be about? Now I know that others have experienced things like this in their lives too and bless you for that. I've never been one for other people to feel sorry for me...it just is how it is! Sometimes I have to remind myself that God is in complete control! A verse that I repeat over and over to myself is: Jeremiah 29:11 For I know the plans I have for you," declares the LORD, "plans to prosper you and not to harm you, plans to give you hope and a future. Last year about this time I really wanted to just go ahead and sign myself up to go to the She Speaks Conference where I might, just maybe, learn to get started writing my book. Dear 'ol hubby said, Honey...this is going to be a really busy year for us...did you forget! I think he thought...oh no...here we go again!!!!!!!!! Probably because I'm one to make decisions NOW and figure out the details LATER! So, I held off! I too thought maybe it was just another whim for me. But, here it is the next year and I STILL have an itch to go, still have that book dream in the back of my mind! I would love to be chosen for one of the scholarships that will be given away! Lysa TerKeurst has information about the scholarships posted on her blog. She is one amazing woman!!! If you haven't read any of her books, you're missing out! Click here and check out her books. You will love them! One more thing...Don't ever give up on your dreams...even if you think it's just a "whim". Be in specific prayer and if it's meant to be God will open those doors wide for you (and me)! Someday's it is kind of nice to just sit around in PJ's and do absolutely nothing! Keegen and I made funnel cakes this afternoon...then we all ate them! Not a healthy snack...but quite yummy and kind of fun to make! On the other hand...it's almost 8:00pm on a Saturday night and we've been in the house ALL day!!!!!!!!!! That is way way WAY too much for my hubby!!! We've looked at these walls long enough! Where is the SUNSHINE? Hopefully tomorrow will be a better day! Hope everyone is enjoying their snow day! Well, we pulled up at lunchtime and there was a RIG in my backyard!!! I'm keeping my fingers crossed that we can get as lucky as The Beverly Hillbillies!!!! YA THINK?? They are just drilling for water for the Geo-Thermal but maybe...just maybe...they'll hit oil! Just kidding! It's a beautiful day outside...I'm having a hard time believing that we "may" have snow on Saturday! PLEEEEASE...... STAY AWAY!! I want the sunshine!!!! and wondering...who's cleanin' up this ^!!!!! Everyday now there are new changes! Everyday...it gets closer and closer!! I'm starting to really get excited!! WOW...things are moving along so fast now! If the warm weather would hurry up and get here and STAY...we could get moved in soon!!! I met the floor stain crew at the house at 8:00am. We picked out a color from the samples they did last night and they got started! They called me at 10:40am to come take a peak to see if I liked it before they put the sealer on! I LOVED IT!!! Can't wait to see the finished look!!! What am I getting myself in to?? Well, I got to experience REAL farm life today! 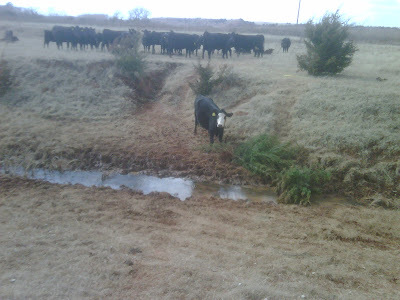 Mike and I went out to feed cattle during lunch. 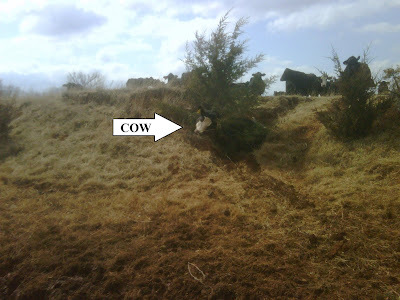 He called them all in and as they were running for their "lunch"...one of them fell over in a wash out right beside the cattle trail. Mike had 5 min. before he had to be back for the next appointment so I told him to head back to town and I would figure out a way to get the 'ol gal unstuck! Sometimes I speak before I think!! So I dropped Mike off and headed to pick up Brock (thank goodness he was available!). It's a long story...it took about 2 hrs. to get her unstuck and back up on her feet! But...WE DID IT!! 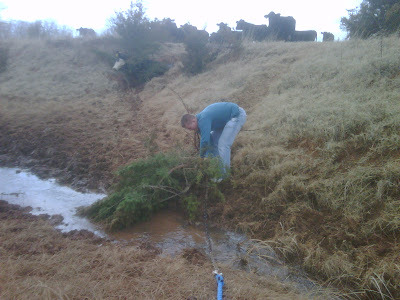 After uprooting 2 cedar trees to get her out! All I had was my cell phone so I started to take pictures! I just love to "document" life!! Someday everyone (my family) will thank me! It's fun to look back on! Thank you Brock-lee for all your help!! Love ya!! Our little stray...they had been calling Ruby. 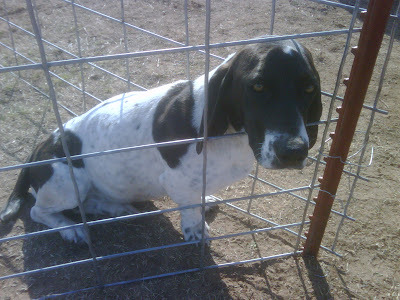 I accidentally mentioned one day, to my hubby, that when we got to the farm I would like to have a Basset Hound for outside! Low and behold...Mike had a customer that came in and said that they had a stray "Basset" that had been hanging out at her house for over 2 weeks. Wait a minute...we're not ready to move to the farm...I'm not ready for dog duty! I went to take a look anyway. Ummm...never seen a Basset like that before! She kind of looks like a Pointer that has squatty legs! She's a really sweet dog though so I think we'll keep her! We took her to the vet and he thinks she's about 1 yr. old. And...we got a BONUS...5 for the price of 1...FREE!!! She's gonna have pups, he felt 4 little ones in there!! She is extremely hard to keep at home and I've worked for 2 days to figure out a way! No wonder she was a stray! So check back on the saga of the "Basset" Ruby!! Oh yeah...if you would like to have a puppy...I'm already taking orders and it's filling up fast. So don't wait too late to place a hold on YOUR next lovable, squeezable, hugable, puppy!! And the best part is it will be FREE!!!!! Well one more project on the house complete! I LOVE IT!! Better than I ever dreamed it could be!! Too bad I won't get to use it until next year! Oh well...those cold winds can stay away!! I'll just burn candles in it if I want the "fireplace" effect!